Humans take away freedom of choice by locking criminals in jails as punishment for their crimes. Consider the horse, always innocent and has not committed any crime but has little, if any, real freedoms or freedom of choice. It is made to do our bidding when and where we want it to and compelled to stay wherever we say it must. Finding ways to have what we want become the horse’s idea and free choice is a BRILLIANT aspect to training that is rarely applied. This does not mean that humans should be irresponsible concerning the behavior of their horses. It does not mean allowing a horse to do whatever it wants when we are with it. It does mean that horse owners and trainers get very smart, creative and proactive in positive ways with their horses during all interaction and training. By following the example of the leader of the wild horse herd, we can develop a relationship with our horses where it is the choice of the horse to ‘follow our lead’ and try to comply with all reasonable requests made appropriately. Most of us do not have the opportunities now to study the behavior of horses in the wild. But if we did, we would see that there is no coercion by the leader(s) of the herd with the other herd members. When a herd leader determines it is time for the group to move, she begins to go where her wisdom and instincts say to go and the others simply follow her. If this herd leader wishes to move through the group, she simply goes where she wants and the rest step aside. She does not force anything. During those situations when the leader wants to discipline a disrespectful youngster she will, by utilizing very precise body language and the least amount of energy possible, drive the young horse away from the safety of the herd until it is on its own some distance behind the herd. Then she keeps it away through body language until, again via body language, she allows it to return to the safety of the herd. She does not hurt the horse, is not punishing ir and is not angry at the horse. She is teaching this young horse. A horse in the wild, by itself, is very vulnerable to being killed by a predator. The lead horse has used the natural instinct for survival to teach the lesson. It then becomes the young horse’s desire and choice to follow the leader and be compliant. The communication is all body language and the energy conveyed through it. Our human communications contain energy as well. We speak verbally and unconsciously through our bodies, with kind energy, angry/aggressive energy, excited or calm energy. Language can always contain an array of emotions. Effective human communication is often accomplished via being conscious of our energy and intention and the precise choice of words and movement (conscious body posturing) to achieve as much clarity as possible. Horses in the wild herd trust and respect their leader(s). Their survival depends on them. These lead horses always exhibit many of the qualities of great leadership. They have total integrity (honesty, do not hold grievances, do not bully others as some individuals do, seek the peaceful way of being with other members of the herd and more) and are wise in the ways of survival. These attributes of the leader earn the trust and respect of the other horses. Through this earned trust and respect, the others willingly choose, and have as their idea, to follow the wishes of the herd leader. The question becomes; how can we humans develop this same sort of leadership with our horses and have our wishes become their decision to follow? My thoughts on this first involve our own integrity. Are we honest with our horses? By this I mean are we using coercion to get what we want rather than through excellent and appropriate communication, skillful leadership, wisdom of horses and the right skills. Humans use coercion (force, bribery, threats, fear) with horses out of ignorance or because it appears to be expedient. We tend to want what we want from our horses, and we want it now. This is not leadership and does not demonstrate integrity. Patience and consistency are also very important aspects of being trust worthy and earning the respect of others. These elements also are part of good leadership and integrity. I have seen professional trainers and teachers showing little patience with a young horse that is fearful of moving forward. They think that the horse is being stubborn when it is merely afraid. Rather than having the patience, knowledge and skill to really train the animal, many will simply punch the horse in the ribs with their heels repeatedly and use a whip or crop to push the animal forward. This is not leadership, nor is it good training. Additionally, it teaches the animal to be afraid of human’s legs and prompts it to not like being ridden. This teaches the horse to resist the human’s requests rather than supporting the horse in choosing to comply with the human’s desires. It is applying the application of fear rather than reward for effort. These trainers justify their behavior by saying there is not enough time to use positive reinforcement and/or that the animal should simply do as they say for one reason or another. This trainer has shown they do not understand positive reinforcement as a training principle and that they prefer force over patience. It shows they lack real wisdom of horses or respect for them. 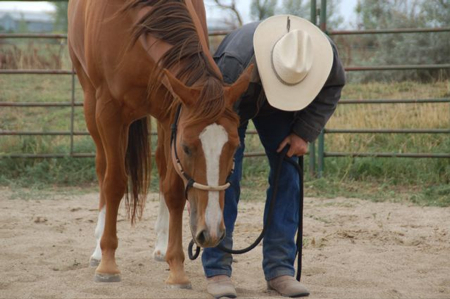 The reality is that positive reinforcement does help to create a positive proactive response with horses. It will help the horse to actually choose to comply with the human’s wishes. Positive reinforcement is more efficient than a punishment because it teaches what we want the horse to do willingly, rather than forcing the issue by using fear of pain or discomfort as a motivator. Supporting our horses in maintaining a good attitude towards our interaction with them is extremely important. Horses will naturally pick the easiest route and the path of least resistance. They will choose to pick a way that is the least amount of work, the smoothest and most comfortable. This is how the mind of the horse works. They would actually like to have most primary decisions made by somebody else, as following a good leader takes less effort (decision making) than making those decisions themselves. So, rather than using punishment for unwanted behavior or non-compliance, humans could simply get smart about it and find a natural block to the horse going against the wishes of the human. An example of this would be if for some reason a horse begins the habit of swinging its head at a human, the human could simply hold two fingers or their elbow in such a position that the horse pokes itself in the cheek when it swings its head. It won’t take long for the horse to realize that swinging its head at the human is not such a great idea. Or, if a horse, when on a line or at liberty, will only move in one direction the handler can simply position themselves and the horse so that moving in the direction the horse is trying to go is blocked by a wall or fence. Leaving the opposite direction open and easy for the horse to move towards will eventually make it the animal’s idea to go in that direction when requested. This is not rocket science. This sort of training is logical, makes perfect sense, does not create fear or resistance and works. So we horse owners and trainers have a choice. We can choose the path of peace with horses or the path of conflict with our training methods. 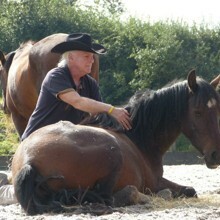 We can choose to reward behavior we want by removing all pressure from the horse and offering it some moments of peace. Or, we can punish the horse for being disobedient as we would some sort of slave. Horses and humans are teachers and students for each other.